This review originally appeared on the book review blog: Just One More Pa(i)ge. I had never heard of this novel, or author, until a few weeks ago when he emailed to say that he enjoyed my reviews and would I be interested in reading/reviewing a copy of his soon-to-be-published novel about a girl who thinks she is Death. Well, that just sounded a little too intriguing to pass up. Plus, as a still fairly nascent book blogger, I was super flattered regarding the compliments to my reviewing style. (I won’t lie.) So, here we are. This was definitely an entertaining read. The slightly off-color sense of humor and snarky tone, set before you even start reading by the cover design (which, I have to say, I really enjoy), is consistent throughout the novel. Although at times the writing itself is a little juvenile and forced, at times I did get a little annoyed by the simplicity and didacticism of the internal monologue and the use/repetition of many stock phrases, I think the general feel of the writing stayed on point and created a mood/atmosphere that I definitely liked. The dialogue was inconsistent in its delivery – at times awkward and stilted but at others really natural and on point. Relatedly, I think there are points where the plot flows smoothly and realistically and other times that things happen just a little too conveniently (though after I read the ending, it’s possible that some of that can be explained away…a little). All in all, there was never a point where I got too frustrated to keep reading, I was definitely into the story and the characters, I just think a little more focus on consistency in style and working to ease up on abruptness of transitions/connections would really help. Regardless of some of those shortcomings, I LOVED that for the entirety of the book, pretty much until the last few pages, it remained unclear whether our protagonist was truly Death or if she really was just a messed-up girl named Dorothy. Like, I cannot say enough good things about how well the author managed to balance the two possibilities. Occasionally we’d be thrown little things like her speaking a phrase of Russian out of the blue or knowing the story of how someone died before she was told, and you’d be like ‘O, ok, she could actually be Death and is just missing her powers.’ And then at other times, all the normal/mundane details would overwhelm those small moments and you’d be back to thinking that they were some kind of fluke or that she got lucky, and she really is just a confused, crazy young Dorothy. The role(s) played by some of the supporting characters, like Curtis, really help prolong this back and forth. This is just such an awesome concept and was executed smoothly and competently, stringing me along (making me want to read faster and faster so I could finally find out) all the way until the end. I also really like that the “lesson” of the story, if you will, is the same no matter which version is true (whether our heroine is actually Death or ‘just’ Dorothy) and that you “learn” it before the final reveal. In line with all that, I think the ending is spot on. I was worried, considering how long the build-up was, that when we finally learned the truth it would be a bit anticlimactic. Well, definitely not the case – it was creative and unexpected and really nicely pulled things together without any of it getting too…mushy/cliched/obvious. Very satisfying. Overall, I enjoyed this novel. I was super impressed with the premise and the way it was pulled off – handily accomplished. There were some aspects of the writing itself that I was not as impressed with, but those are much easier to fix (and overlook) than conceptual problems. Definitely a fun read and, if you have a bit of an off kilter humorous side, this story will keep you amused. I received an ARC of this book from the author, in exchange for an honest review. Thank you for the opportunity! 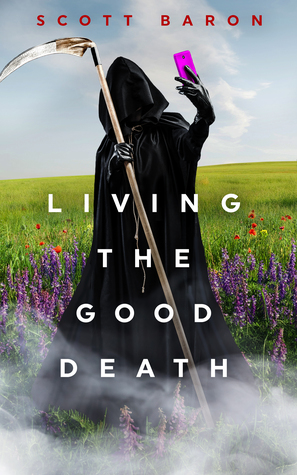 Sign into Goodreads to see if any of your friends have read Living the Good Death.